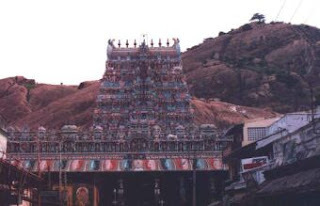 Tirupparankundram, a hill five miles southwest of Madurai, is the fourth pilgrimage site of Muruga. A cave temple dedicated to the element of earth and mentioned in various classical Tamil texts as the 'Southern Himalaya' where the gods assemble, Tirupparankunram is also mentioned in legend as 'the place where the sun and moon abide'. Murugan was married to Devasena(or Devayani) upon the hill and for many centuries the Tamil people have considered it the most auspicious place for their own marriages, especially during the time of the Pankuni Uttiram, the festival of marriage held in late March. Besides the fantastic temple to Murugan on the hill, there is also a Muslim shrine dedicated to 'Sekunder' or Alexander, the great who is associated with Murukan by the Muslim pilgrims. "Sikandar was a friend of Murugan at the time when Murugan was King here," they say. Tirupparankundram is situated three miles southeast of Madurai on the main railway line. It is one of the Aru padai veedugal or six sacred places selected by Lord Subrahmanya for his abode. The importance of this temple is that here was celebrated the marriage of Lord Subrahmanya with the daughter of Indra, Devayani. Long, long ago, when Lord Subrahmanya was staying at Kanda Verpu, the two daughters of Lord Maha Vishnu, Amrita Valli and Sundara Valli, cherished the desire of becoming the consorts of Subrahmanya. With this aim in mind they both went to Saravana Poigai and commenced austere penance to fulfil their desires. Pleased with their prayer and worship, Lord Subrahmanya appeared before them and told Amrita Valli, "You will be brought up by Indra as his daughter and I shall marry you in due course." Her younger sister Sundara Valli was also graced with a similar blessing. She was born to sage Sivamuni and brought up by Nambi, the headman of Veddas. Amrita Valli took the form of a female child and went to Mount Meru, the abode of Indra, and told him, "I am the daughter of Maha Vishnu and the responsibility of looking after me has been entrusted to you." On hearing this, Indra became very happy and directed Airavatam, his white elephant, to take care of the child. The elephant with all love brought her up and affection and she attained the age of marriage in course of time. Hence she came to be known as Devayanai, one who was brought up by the heavenly elephant of Indra (yānai in Tamil means elephant). The six sons of sage Parasara were cursed to become fishes in the Saravana Poigai. On request for redemption, these six boys were ordered to pray to Lord Subrahmanya. When they got his darshan, they could get redemption. It was also made known to them that Lord Subrahmanya would come to Tirupparankunram after vanquishing the demon Surapadma. Anxiously they waited for the arrival of Subrahmanya. When the mission of Subrahmanva to vanquish Surapadma was over at Tiruchendur, on his way, he came to this spot followed by all the devas and heavenly beings whom he had released from the untold miseries caused by Surapadma. On his arrival at Tirupparankunram, the sons of Parasara received Subrahmanya and, at their request, he consented to stay there. He at once ordered Viswakarma to construct a beautiful abode for himself, for the devas and for others. He also suggested to the heavenly architect to build roads and erect a city around them. Indra, the king of the angels, desired to get his daughter Devayanai married to Subrahmanya, as a mark of his gratitude for relieving him and the devas from the depredations of the demon Surapadma. He expressed his desire to Brahma and Vishnu who were present there. They were only too glad to hear the proposal. When they communicated the desire of Indra to Lord Subrahmanya he readily agreed to it and said: "Devayanai has been praying at Saravana Poigai in the Himalayas for this happy marriage. Now the time has come for its being solemnised." As Subrahmanya agreed to this marriage, Indra sent a messenger to bring his wife Indrani and daughter Devayanai from Mout Meru.